Lawn care, pruning & planting schemes. Greensteds are fully Royal Horticultural Society trained and can help you create a garden that will be the perfect place to unwind and relax or a safe place for the kids to play and burn off that excess energy. If you just want Greensteds to maintain your garden, you can choose from weekly or fortnightly visits, we can cover all of the Chelmsford and Essex areas and even further afield. Your garden can be like an extra room during the long summer months, talk to us today about how we can transform your garden area into somewhere to be proud of. Fay and her team have been maintaining my (rather well stocked) garden for over a year now and I have to say it has never looked better. Highly knowledgable, tidy and polite. I recommended her to 2 of my friends, who are equally as pleased with her work! Some of the garden maintenance jobs that we can do for you. Whether your lawn is big or small, we can regularly cut and maintain your grass lawns and their borders. We can also create a new lawn for you from either turf or seed. Call us to discuss which would be the most suitable option for your garden. Garden weeding can seem like a never-ending task. We can remove the weeds for you on a regular basis and also prepare the ground for the plants that you want to be growing in your garden. Pruning is carried out at the correct times of year to improve plants health and appearance. Applying various organic materials and supplements to your beds will improve the soils ability to retain nutrients and improve the soils structure. Planting new plants for seasonal displays or perennials and shrubs for lasting effect. If you are planning on creating your perfect garden from scratch, you may need to have the site cleared beforehand to give yourself a clean sheet to work from. 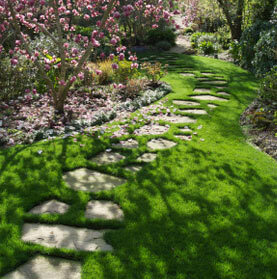 Greensteds can do this for you as well as designing and maintaining your new garden. Fallen leaves can cause problems with lawn health as well as clogging up your drains. We can take all the hard work out of leaf clearance for you this autumn. Growing vegetables can be rewarding for both you and your bank balance and a vegetable plot can also encourage children to appreciate and enjoy vegetables. We can create and maintain a vegetable plot for you and advise on the best varieties to grow. Email us or call us on 01245 248 484 to chat to us about your garden plans and ideas.